Reminiscing about a past you have never actually experienced can be an interesting experience in itself. Your mind tends to create a utopian image of the way people used to live and instill upon your current psyche a sense of loss for something you never had. Whether it ever existed or not, my mind likes to go to a place in the not-so-distant past where people sourced products from those who were experts in a particular trade and whose knowledge of their craft was both a matter of personal pride and value to their customers. Our busy lives make this type of product sourcing difficult (as does the cost). The ubiquitous all-in-one-vegetable-hermetically-sealed-vacuum-packed-meat-deli-baker-green-grocer is an easy, and in many ways, logical option. With that said, I look fondly on those quiet mornings when nothing dire needs my attention and the sun and blue sky beg me to take a walk and pick up the products I need for that evening’s dinner. This particular Sunday morning started with the craving to make a pasta dish similar in some respects to the spaghetti with meat sauce my grandma made when I was growing up and that my wife (and many other family members) love. 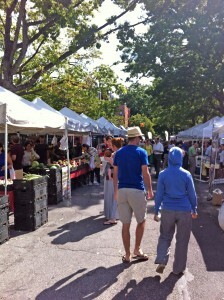 The day started with a short stroll from my apartment to the Sunday Farmer’s Market held at Washington Park. (Fun Fact: Washington Park was home to the Brooklyn baseball club which would later move to Ebbets Field and become my beloved Dodgers.) Here I scored a large bunch of fresh basil for $2–a steal by New York (or really any) standards. Basil in hand (along with some awesome sourdough bread from Orwashers bakery) I headed over to Cobble Hill. 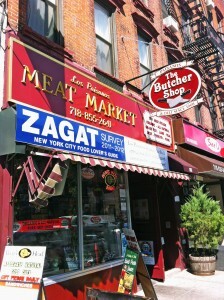 My next stop was to pick up the meat for my sauce at Los Paisanos Meat Market. 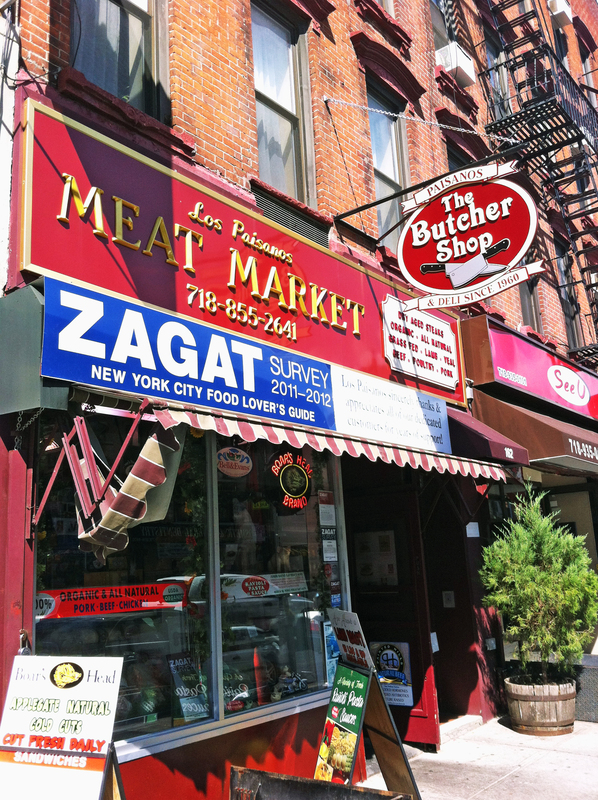 Los Paisanos–a Brooklyn institution for over 45 years–provides great meat, fresh pastas, cheese, and many other Italian specialties. The main reason I came here was to obtain some guanciale, which would form the heart of my sauce. 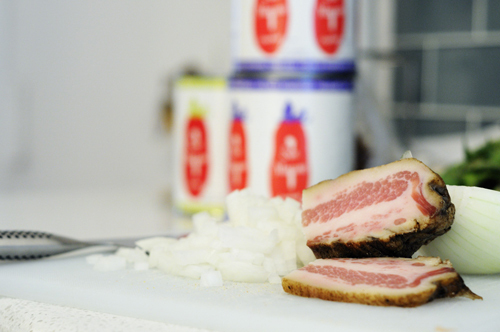 Guanciale is a lot like bacon, but uses the hog jowl rather than belly and is not smoked. The jowl is much fattier than the belly and has a more pronounced porky flavor. This would be the base for my sauce, providing delicious fat and a rich cured saltiness. While there, I rounded out what I needed for the sauce, picking up canned San Marzano tomatoes, a well-aged Parmesan cheese, and housemade ground beef mix. I began by cubing up a chunk of guanciale about half the size of my fist. I threw it into a heavy sauce pan and rendered out about half of the fat. I then added a diced yellow onion and sweated it out. From there, I added a pound of freshly ground beef and browned it. Next went in three 28 oz. cans of crushed San Marzano tomatoes, which were left to cook under very low heat for about 4 hours. With about 30 minutes left I added a handful of chopped basil and adjusted the seasoning with some kosher salt and pepper, as well as a splash (or three) of red wine vinegar. The fresh penne pasta that I purchased from Los Paisanos was boiled in water for about 4 minutes before cooking for another 3-4 minutes in the actual sauce. The plate was finished with some freshly ground aged Parmesan cheese and paired with Seizoen Bretta from Logsdon Farmhouse Ales. So, was the pairing any good? This was a wonderful pairing. 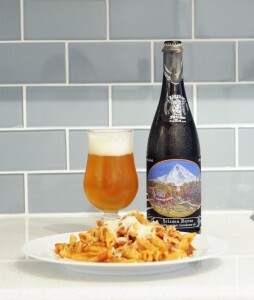 The Parmesan cheese that was used had a nice fruitiness as well as an earthy undertone that sang wonderfully with the earthy brett used in the saison. 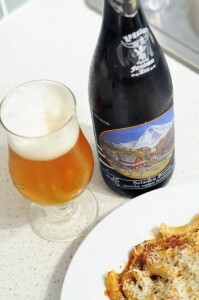 Additionally, the saison was very effervescent and had a firm bitterness than created a nice interplay with the fairly rich and flavorful sauce. The only negative aspect was that the beer had a bit of a plastic / peated scotch phenol, which was a little harsh and stuck out a bit from the overall harmony of the pairing. 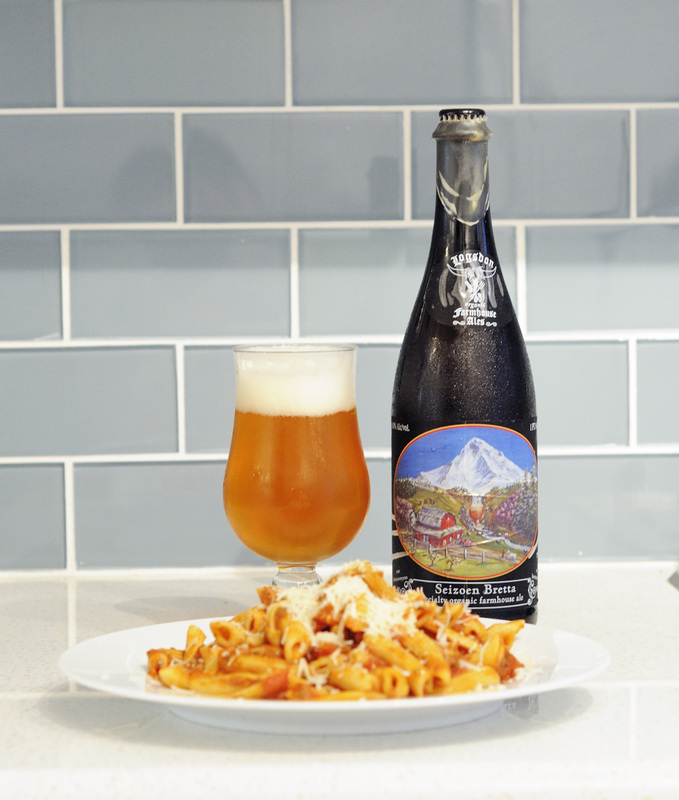 This entry was posted in Food (with Beer) and tagged ale, american beer, belgian beer, food pairings by Nick Ladd. Bookmark the permalink. That is actually a great pairing. I can definitely see the peppery notes of the saison playing well with the tomato sauce! That makes for a well-balanced integrated flavor experience!